SINGAPORE companies must aim to have a stronger Singaporean core and better quality foreign labour, Minister for Manpower Lim Swee Say told Parliament on Monday. Mr Lim said the aim is to "strengthen our competitiveness and sustainability by becoming more manpower lean with a stronger Singaporean core and better quality foreign manpower, as we reposition our economy for quality growth". He reiterated that the manpower ministry is making further enhancements to send a clearer and stronger signal about fair consideration for Singaporeans. For example, from Oct 1, 2015, advertisements accompanying Employment Pass (EP) applications must include published salary ranges. There will also be a closer scrutiny of EP applications for companies with a weaker Singaporean core relative to others in their industry, and more stringent quality assessment of EP and S Pass applicants. Companies with a weaker Singaporean core will also be required to provide additional information, such as the number of applications from Singaporeans, how many were shortlisted, and the interview outcomes. 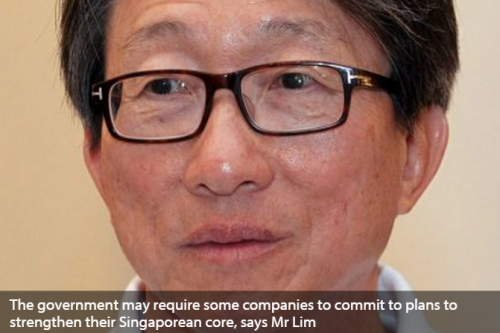 "We may also require some of them to commit to plans to strengthen their Singaporean core," Mr Lim said. The former labour movement chief, who came into his new job on May 4, was replying to a query on whether the EP and Jobs Bank schemes could be further tightened to ensure that employers are required to give due consideration to applications from qualified Singaporeans first and that EP applications must be accompanied by evidence that the hiring of foreigners is done only after unsuccessful sourcing from the local talent pool. Mr Lim said that government initiatives have led to "a fairer hiring process and easier access to job opportunities". To ensure that companies give fair consideration to Singaporeans when hiring, the Fair Consideration Framework and Jobs Bank were introduced. So far, almost 20,000 employers have registered more than 72,000 active job postings with the Jobs Bank, drawing 110,000 local job seekers to register as well. Jobs here refer to the "average number of live job vacancies", which is the summation of the unique number of job vacancies which are active at the end of each week, averaged across the total number of weeks in that reporting period. Since he came on board, Mr Lim has emphasised the need for Singapore to boost its labour productivity to achieve targeted growth rates as the workforce is not growing as fast. Instead of yielding to calls by some employers for the government to ease up on the tightening of foreign workers, Mr Lim wants to focus on making the economy manpower- lean, with a core Singapore workforce and quality foreign pool.